You guys, can we talk about side dishes for a minute? Especially summer salad side dishes? Because, I’m admittedly pretty bad with side dishes for summer bbq meals. This likely has to do with the fact that I’ve never been a fan of mayo-based salads (also noted here) but I’ve been working on this aspect of my kitchen game over the past couple of years. Take this bacon ranch potato salad: perfect in every way. And this black bean and roasted corn salad? Another proven winner. Also, two of my all-time faves, roasted veggie, feta, orzo salad and curried couscous, also take the cake. 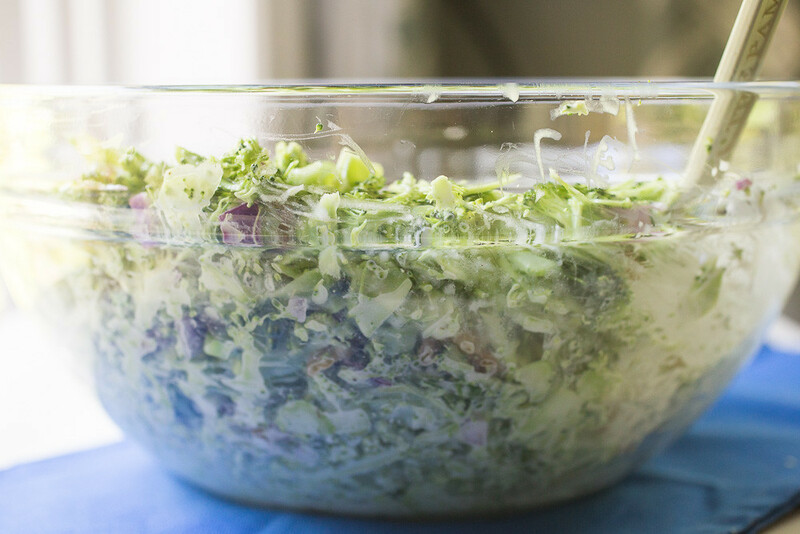 But it’s been quite a while since I’ve made any new and exciting summer side dishes; that is, until this broccoli slaw came along. 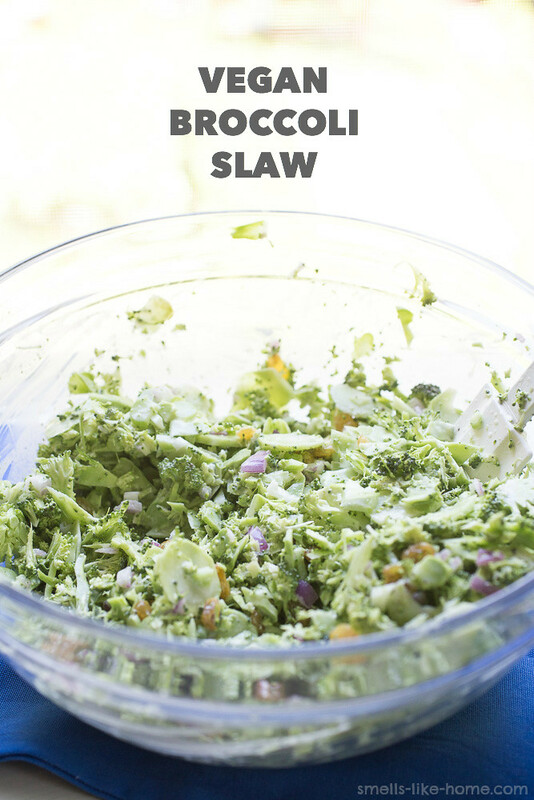 You can, of course, make the non-vegan version of this slaw by swapping the non-dairy milk for buttermilk and using regular mayo. I have no doubt this recipe is stellar made with dairy; we just chose to make it vegan. Chop the broccoli florets into small enough pieces that will fit through the feed tube of your food processor. With a vegetable peeler, peel off the top layer of the stalks and chop them up as well. Surprisingly, simply peeling the stalks makes them quite palatable in raw form. Attach the slicing blade to the processor and drop the broccoli through the feed tube with the processor running. 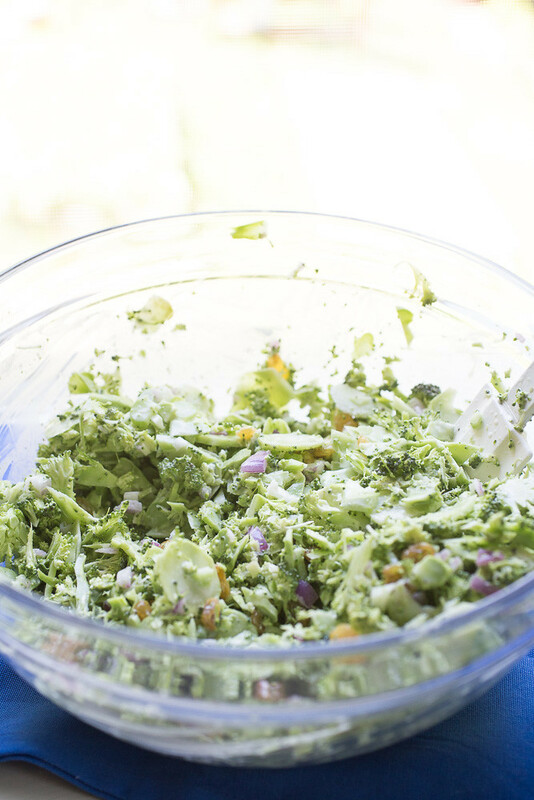 Scoop out all of the broccoli into a very large bowl and toss with the raisins and red onion. Whisk all of the dressing ingredients together along with a good pinch of salt and pepper in a glass measuring cup or small bowl and pour the dressing over the broccoli. Toss to coat well and season with salt and pepper to taste. The slaw can be served right away or left for the flavors to marry a little in the fridge for a couple of hours. The broccoli will stay crisp, stored in an airtight container in the fridge, for about 5 days. This looks so good! Mayo-based slaws and salads aren’t my favorite, but they especially gross me out in summertime. The thought of them being in the heat is just not appetizing. I love broccoli and can’t wait to try this!